The idea of load balancing is well defined in the IT world. Its primary function is to distribute a workload across multiple computers or a computer cluster, network links, CPUs or other resources. The result achieved is maximized application availability, optimized resource utilization, maximized throughput, minimized response times, and of course, avoiding application server overload. 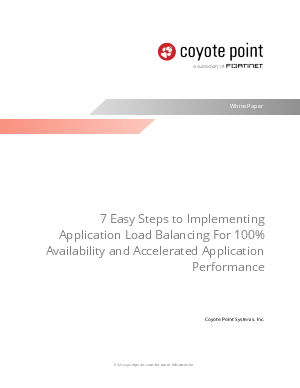 Implementing load balancing, however, may be less understood. Organizations may cringe at the perceived scope and potential cost of implementing this methodology and this type of appliance into their infrastructure. The good news is that deploying an ADC for load balancing needn’t be perplexing or difficult at all. In fact, installing a Coyote Point Equalizer™ ADC into your existing web server infrastructure can be accomplished easily and with minimal changes to your existing network configuration.